Snack time! 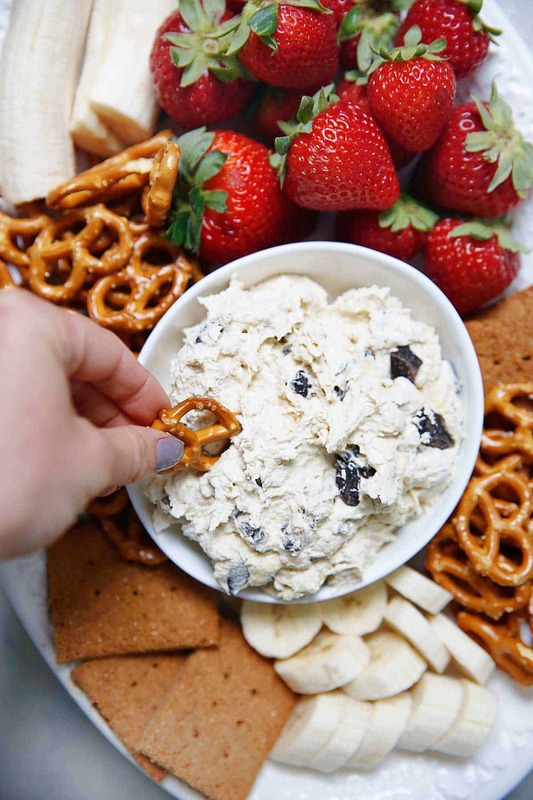 This Gluten-free Edible Cookie Dough Dip is our new favorite! Think all of the delicious and creamy flavors of regular cookie dough, but without flour or the eggs… snack time, or dessert time, WIN! Sometimes you just want a dessert that doesn’t require baking! Am I right? Get creative with this fun dip and pair it with your favorite dipping scoopers of choice for a fun and delicious dessert everyone will LOVE! 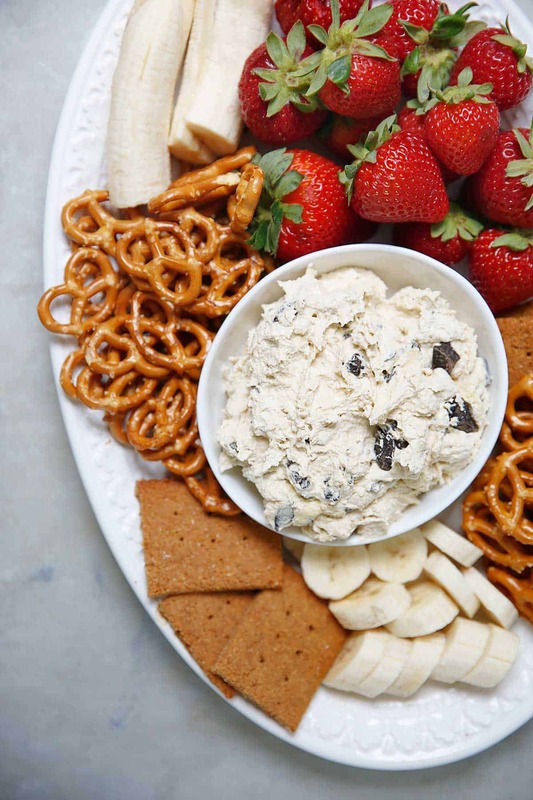 Berries, bananas, gluten-free pretzels, and graham crackers are a few of our favorites! 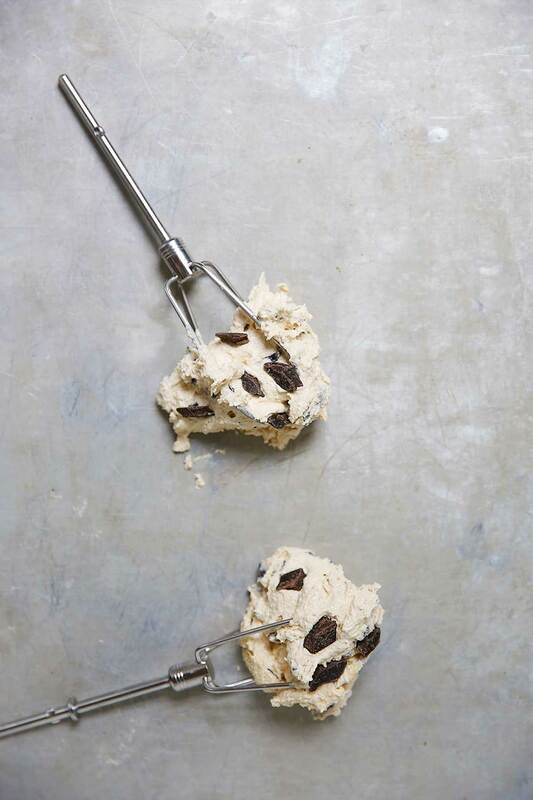 This Edible Cookie Dough is creamy, not too sweet, loaded with delicious chocolate chips, and so perfect for dipping your favorite fruit or pretzels in!You can also freeze the edible cookie dough and roll it into balls to make the ultimate gluten-free bite-sized treats! Using a stand mixer or hand mixer, mix the powdered sugar and butter until well creamed together and fluffy. Add in the rest of the ingredients, excluding the chocolate chips and mix on high for about 5 minutes until well blended and completely fluffy. Add in the chocolate chips and mix again until fluffy and ready to serve. Place in desired serving bowl and serve with dipping ingredients of choice! *Freeze the leftover cookie dough to make a dough that you can roll into balls, for a delicious cookie dough treat! **Make the graham cracker version of the gluten-free crackers in my book (page 78)! OMG this is so fun! And honestly, sometimes I like the cookie dough WAY more than the actual baked cookies. So this is right up my alley! I bet it’s so good with the pretzels. That perfect salty-sweet bite! YUM! I bet my kids would absolutely love this! So ready to dig in!! Quick question….how does this recipe have no refined sugar in it if it calls for powdered sugar? Is there some new alternative for powdered sugar? Thank you, trying to stay away from refined sugars and was excited about this recipe, but I’m a little confused. I’m with maria. that whole bowl could be eaten in a sitting! Haha YUM! This recipe is a GAME CHANGER!!!! This looks amazing. I want it now with the strawberries! I’ll have to make it this weekend. Can’t wait. Yum. This dip looks delicious. My kids will simply inhale this. I’ll have to make a double batch. I don’t want to miss out on it myself. This recipe was so easy to make. Only took 5 minutes and almost no tools. A simple electric hand mixer is fine. I mixed it all in a serving bowl so not much to wash. Like a lot of people here I like eating cookie dough more than the cookies. *Perfect*, thanks Lexi!